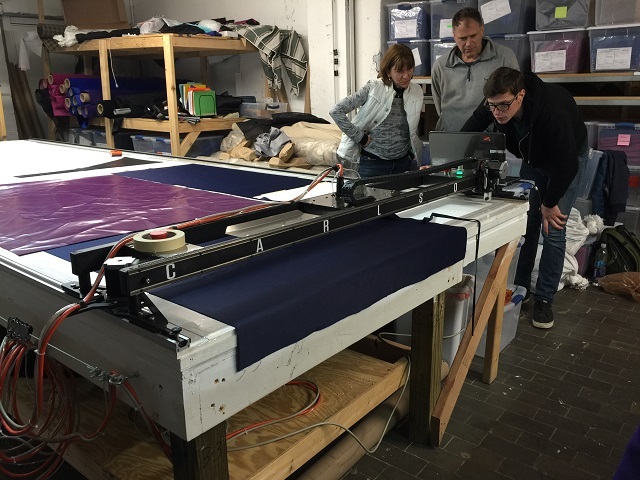 Jeff and Rose own and operate Abrams Bed, LLC – Maker of The Safety Sleeper™ in Pittsburgh, Pennsylvania creating custom bed enclosures for special needs individuals. The tent-like mattress enclosure was created for their autistic son Abram to keep him safe at night without his parents worrying. The Safety Sleeper™ is a fully enclosed bed system that will provide you the peace of mind knowing that your loved one is secure, tucked safely away from any danger. The Safety Sleeper™ does not only help prevent your loved one from unattended wandering, but also empowers him to wind down and go to sleep on his own by reducing visual stimulation and the opportunity to play or roam. Jeff and Rose knew something had to change in order to continue to grow without hurting the quality of their product. The main contributing bottleneck: cutting. Their sewers were spending too much time cutting and marking parts and not enough time sewing and assembling sleepers. Ever industrious, Jeff and Rose outsourced their cuts to a local subcontractor to free up the sewers but repeated issues with parts being incorrectly cut had them scrambling to find a better solution. 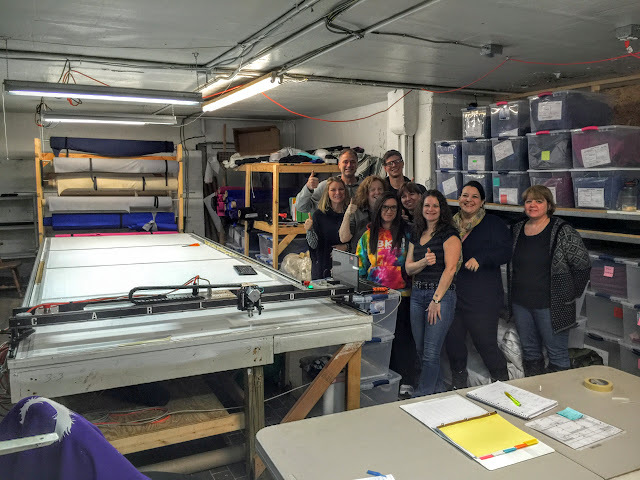 After considering their needs they purchased a PT-72″ model and I traveled up to Pittsburgh to get them up and running. The group gives the trademark Carlson Thumbs Up! The Carlson Plotter Cutter rides in track that is mounted onto the table edge. To run the machine quickly without stalling requires an extremely flat table top surface – a difference of a quarter inch between high and low spots along the edge of the table is enough to cause binding and potentially effect the accuracy of the plotter cutter. Most buildings will settle over time which leads to subtle changes in a floors height that aren’t immediately obvious to the eye. 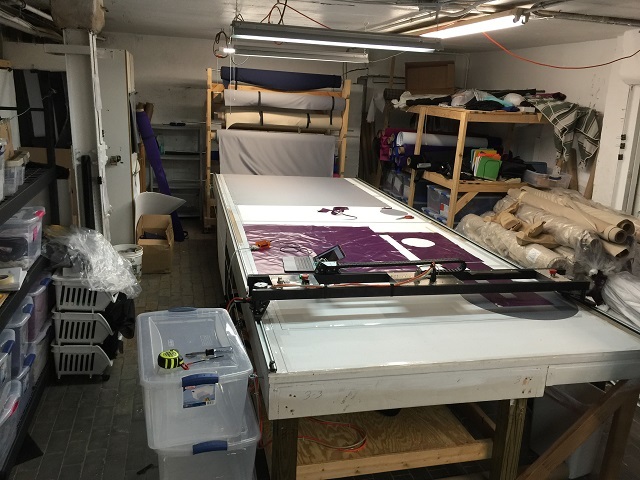 Jeff and Rose decided to modify a wood framed cutting table they had been using as the table for the plotter cutter. Jeff created a vacuum chamber using staggered 1″ x 1″ wood spacers on top of the existing surface, 1″ x 1″ strips along the edges of the table to create a seal, and two 4′ x 8′ 3/4″ thick drilled MDF as the table tops. 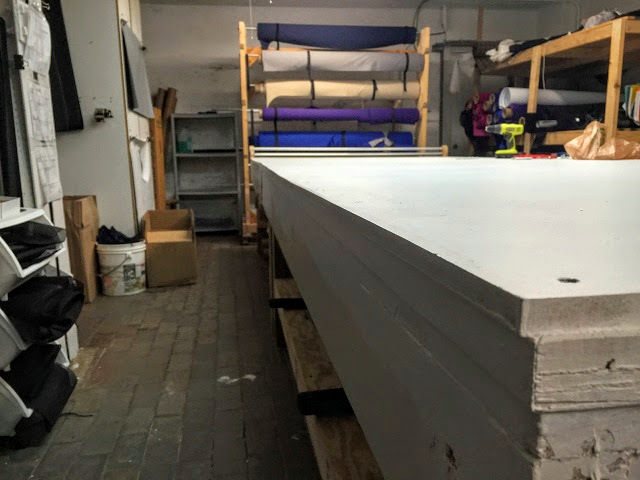 The old wood framed table was showing its age when I arrived to install the machine and saw the peak in the middle of the table where the two MDF tops meet. Luckily, Jeff was on hand with his handy hand plane and we spent much of the first day pulling plumb lines along the edges of the table and delicately removing slivers of wood until we had an acceptable table edge. The picture is hard to interpret but the bump along the edge at the middle of the table rises around 1/2″ above the flat edge. The table edge being thoroughly dealt with, the rest of the installation went smoothly. The power, control, and air cables were routed along the side of the table to keep them out of the way, overhead cabling was not an option for their current setup. David piloting the plotter cutter on its maiden voyage. We have some scrap material on the table to test the vacuum strength and try some test cuts before pulling more expensive materials. The sleepers have mesh sides which is great for letting air flow over the occupant but it’s a drag for the sewer to cut. 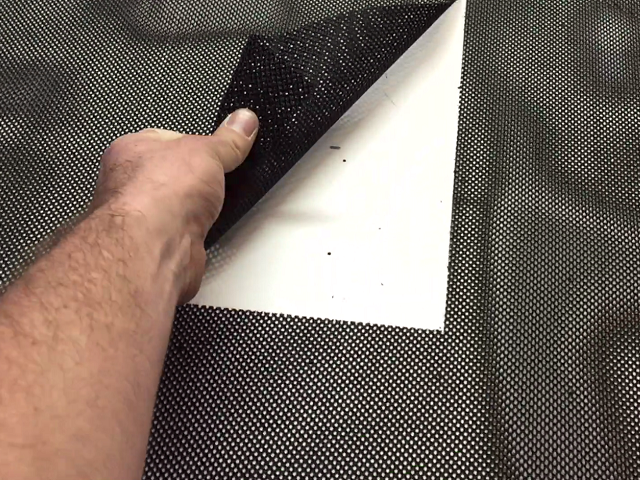 It takes a long time to do by hand without accidentally stretching or pulling the stretchy mesh. The first step for cutting the mesh on the plotter cutter was recreating their hand traced patterns using the drawing program Sketchup that we provide. It’s as simple as clicking and transferring the measurements from the pattern into the computer. Once the patterns were made we unfurled the mesh on the table, taped the edges down to prevent it from moving, and started cutting. Nice clean cut through a synthetic mesh material. No vacuum is being used during this cut. The table was also set up to cut sheer polyester fabric as seen in the video below. The thin and porous material needs good vacuum suction to stick to the table and not be moved by the action of the rolling blade. The patterns cut by the plotter cutter at Abram’s Bed were digitized using Sketchup, a free drawing software that we provide with our installer. The digital patterns were made by inputting the measurements from their paper dimensions sheet that was used when cutting parts by hand. The cutter made parts were held up against their paper tracing patterns and they fit perfectly – Sketchup rocks! Thumbs up for a great installation! First time to Pittsburgh – what a cool city! Jeff and Rose are a great team making a great product. 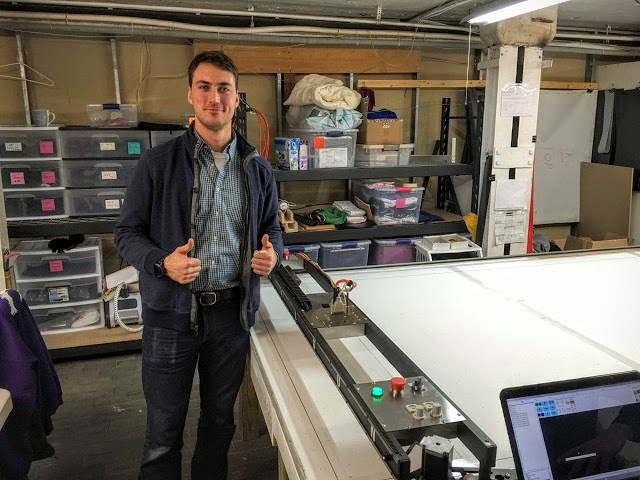 We are looking forward to many productive years of automated cutting from Abram’s Bed!